After obtaining Platinum Elite status on the Marriott Rewards (soon to be called Marriott Bonvoy) program, I have been a lot more eager to try out properties because the 4:00PM guaranteed late check-out benefit is something that I value a lot. Therefore, when I visited Bangkok late last year, I decided to stay at the W Bangkok which is somewhat connected to Chong Nonsi BTS station. There are plenty of direct flights between Singapore and Bangkok but I definitely recommend flying into Suvarnabhumi Airport (BKK) instead of Don Mueang International Airport (DMK) since it is a lot less chaotic. Click HERE to compare room rates for W Bangkok! I have pre-arranged transport for a car to pick me from Suvarnabhumi Airport to W Bangkok and this is done via Klook - I have booked my airport transfer on Klook but due to the heavy downpour and possibly poor-planning, I had to wait close to 45 minutes at the airport for my driver to arrive. Now if you have been following my website fairly closely, you would know that waiting is one of my pet peeves and the very reason I spend extra money to arrange for transport is so I do not actually have to stand around while waiting for something to happen. Obviously I was not pleased about the situation and I will probably go with Oriental Escape the next time I visit Bangkok since I have had nothing but great experiences with them (even though they are almost 60% more expensive). If you are feeling rich, W Bangkok can arrange a Mercedes Benz S300 to pick you for approximately S$130 each way. As soon as I got to the W Bangkok, my luggage was quickly taken care of by the bell desk team and I breezed through the lobby to get to the front desk. My Platinum Elite status with Marriott Rewards was recognised and they even offered both the welcome points amenity and breakfast for two since it was my first stay. The staff was also deeply apologetic that the Studio Suite (lead-in suite category) was not available during my stay but that was perfectly fine. I do enjoy getting upgraded on my stays but obviously it is a benefit not a guarantee (it is shocking how some people always demand for upgrades without wanting to pay for it). My initial room reservation was made for a Wonderful Room but I was given a one-category upgrade into a Spectacular Room for this stay. Since I got to the property pretty late (no thanks to the delayed airport transfer by Klook), I took all of my room and property shots the morning after. The Spectacular Rooms here in W Bangkok are 43sqm in size (about 2sqm larger than the lead-in room category) and they feature a somewhat angular open floor plan. The wall of windows offer sweeping views of the City of Angels and the bedroom is well-furnished with design influences from both traditional Thai designs as well as something a little more abstract. The over-sized sequin boxing gloves found on the bed are one of those things that people associate W Bangkok with. While they look like a lot of fun (especially for Instagram), the state that they were in was not ideal. Honestly, I can only imagine where these gloves have been and how much they have been through over the years - they were left in a corner of the room and they never made their way back to my bed again (at least for the duration of my stay). W Hotels do not typically have an executive lounge (but I know at least one that does) and the W Bangkok is no exception. However, as a Platinum Elite member, I was given two complimentary drink vouchers that I could utilise during my stay. Honestly, I would have preferred it if two drink vouchers were given per day but I will not complain since the property has already gone above and beyond what is required by brand standards. With that being said, the WOOBAR here at W Bangkok does have a really good happy hour promotion so that works for me. The layout of the room is slightly awkward and I feel like there is just too much clutter - the coffee table located in front of the bed is in a really awkward position and I would have personally preferred to have it removed. The work desk is quite large and that is understandable since the W Bangkok is somewhat positioned as a business hotel too (especially since it is located in a business district). Do not get me wrong though, I love the room (I have already made two separate reservations for this hotel this year) but fitting in too many furniture in an angular room is definitely a challenge. The room also comes with a 40" Flat Screen LED TV which makes it easy for you to catch up on international news throughout your stay. WiFi works without a hitch and I could stream shows on Netflix very easily. One thing that I like a lot about the W Bangkok is the abundance of universal power outlets - even though the hotel is now more than 5 years old, it actually had the foresight to have these installed and it is always the smaller things that matter at the end of the day. If you do like your coffee like I do, you would be disappointed to know that the room does not come with a coffee machine. Fortunately for you, there are a number of cafes located nearby so you can still get your caffeine fix fairly easily. If you wish to bring back one of the iconic boxing gloves, you can actually purchase a much smaller on from the room or upon checking-out. I cannot quite remember the price of these but they are definitely under THB 1,000 (the small one in the photo above, not the ones on the bed!). As mentioned earlier on, there are quite a number of vouchers (in the form of post-it notes) that you can utilise during your stay. What I really need to point out in the photo above is how proactive the room stylists are. I personally consume a lot of water during my stays and they have actually stocked up 2x to 3x more water in my room when I requested for the room to be made up. Now I have been to many luxury properties in the region but none (with the exception of the Mandarin Oriental, Bangkok) has actually taken the initiative to do something like that - the handwritten note is also a cute gesture and I am extremely impressed by the housekeeping team. The bed here at W Bangkok is ridiculously comfortable and I am seriously not sure if that is the same one that every W Hotel in the world uses - I mean, they are typically all quite good but this one was phenomenal. I am generally an early-riser but I struggle to get out of these beds in Bangkok. There is also a W Pillow Menu which can be provided upon request and you may also opt for a personalised wake-up service (that sounds intimidating so I did not try it during my stay). 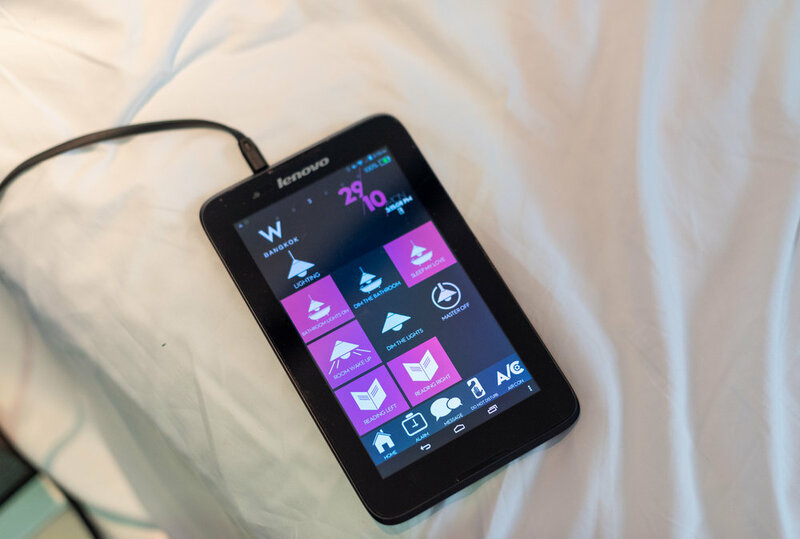 What I have found pretty cool is the tablet located next to the bed - you will be able to control the room lights from this Lenovo tablet but there is a slight lag that is noticeable. Considering how the hotel has been opened for a number of years already, certain things that I would loved to be integrated (e.g. housekeeping and in-room dining) were not. Still this nifty little gadget allows you to control things like your air-conditioning settings, alarms and even your do not disturb sign (there is unfortunately no physical button for this). Here's a word of caution - if you intend to stay at the W Bangkok with a friend, make sure you guys are really close because the bathroom is separated by a coloured-glass panel and there is no way to adjust the opacity of this. What this means to say simply is that, it is entirely possible for someone in the bedroom to see you in your bathing suit if they tried hard enough. Obviously this should not be the case with regular friends but I just wanted to lay all the cards on the table. Bath amenities here at the W Bangkok are provided by Bliss Spa and I really like the Fabulous Foaming Face Wash that they provide. Even though the amenities are just 30ml in size, housekeeping (I believe they are known as room stylists here) has done an amazing job at replacing them. In fact, when they found out they I have gone through them fairly quickly, they actually placed extra sets in my room without me asking (kudos to that!). The freestanding bathtub in the black brick tiled bathroom is great but it can only comfortably fit one adult. One of the best perks of being Platinum Elite is complimentary breakfast and as I have mentioned at the start of this review, the hotel has actually given me both my welcome amenity of 1,000 Marriott Rewards points and complimentary breakfast for two for the whole duration of my stay (you typically have to pick one at properties without an Executive Lounge). Even though the loyalty program guarantees only a continental breakfast for Platinum Elite guests, most hotels in Asia-Pacific offer a full buffet breakfast and in the case of W Bangkok, it was served at The Kitchen Table. The breakfast spread is quite impressive and orders for coffee as well as eggs (made to order) are taken as soon as a guest is seated. When I visited The Kitchen Table at approximately 9AM (like I have said, the bed is incredible), it was fairly busy but I did not have to queue to get in thankfully. There is a rather large selection of juices located near the entrance of the restaurant and I particularly enjoyed the lemongrass drink. I did enjoy the selection of hot food offered during breakfast but let’s just say they did not have any hashbrown over the 3 nights that I was there. If you do enjoy a Thai-style omelette, you may request for it to be prepared for you but honestly, nothing compares to the one I have had at the Hotel Indigo Bangkok a couple of years ago. On the second day of my stay, The Kitchen Table actually offered glass noodles (one of my favourite forms of carbohydrates) at the noodle station so that certainly was the highlight of my morning. Staff at the restaurant were also quick at removing used plates and cutleries so you do not have to actively trouble them to do so. My advice to you is to get down to the restaurant early because you will probably end up overeating (and have no space for other street food in Bangkok) and having time to digest breakfast is extremely important if you wish to check out the weekend markets. The W Bangkok has a decent-size gym where you can get a proper workout but the free-form pool however is quite small so it is impossible to do laps in this pool meaningfully. This property is also a pet-friendly hotel so a W Pet Bed can be arranged upon request. From my understanding, the property charges THB 3,500 per pet for the stay which is quite expensive but definitely worth it (at least for us pet-lovers) if you get to experience the stay with your furkid - I only wish the W Singapore - Sentosa Cove was pet-friendly too! At a price point of approximately S$250-300 a night, the W Bangkok is certainly one of my favourite properties to stay in. The base-level rooms do feel slightly smaller due to its layout but the bed, the food and the amazing service that I have experienced make me want to go back for more. At the time of writing, I have already made plans to visit this property two more times in the year ahead.